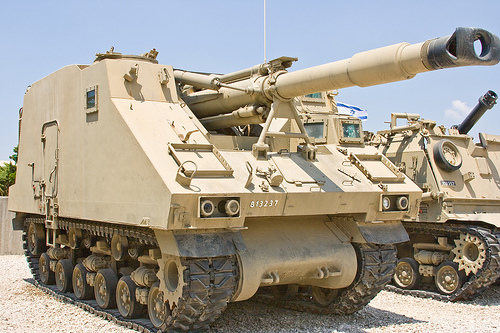 The Israeli’s have demonstrated an almost shocking ability to recycle and turn around what would be obsolete Armoured Fighting Vehicles by other Western Army Armoured Corps standards, in to successful AFV’s. The Soltam L-33 (named after Soltam Systems who carried out the conversion during the 1960’s) is one of these vehicles. It’s a Self-Propelled Gun with a new superstructure built on a modified WW2 M4 Sherman medium tank chassis. The main gun is a 155mm bore calibre and a calibre Length 33, hence the designation L-33. The gun can be elevated from -4 to +52 degree’s. The Super structure in not a traversable turret, the main gun is fixed but can be traversed manually 30 degree’s left or right. Its capable of firing non rocket assisted rounds to a maximum range of 20km. The superstructure is an all steel armour with a thickness of 12 to 64mm. It offers no NBC protection system. The superstructure can store 60 rounds, 16 are ready to use. The vehicle uses a 8 man crew, with the driver having the only night vision sighting equipment. The vehicle was powered by a Cummins VT 8-460-Bi diesel engine, which generated 460hp. This gave a top road speed of 38km/h and range of 260km. Its believed that 200 vehicles were constructed and served in both the 1973 Yom Kipper War and the 1982 Lebanon War. Its no longer in service, but Soltam Systems offer an upgrade to a calibre Length 39 main gun.